By reading the following article, you can get insight on how lead engineers at IBM, Financial Times and Netflix think about the pain-points of application monitoring and what are their best practices for maintaining and developing microservices. Also, I’d like to introduce a solution we developed at RisingStack, which aims to tackle the most important issues with monitoring microservices architectures. Tearing down a monolithic application into a microservices architecture brings tremendous benefits to engineering teams and organizations. New features can be added without rewriting other services. Smaller codebases make development easier and faster, and the parts of an application can be scaled separately. Unfortunately, migrating to a microservices architecture has its challenges as well since it requires complex distributed systems, where it can be difficult to understand the communication and request flow between the services. Also, monitoring gets increasingly frustrating thanks to a myriad of services generating a flood of unreliable alerts and un-actionable metrics. Jason McGee, Vice President and Chief Technical Officer of Cloud Foundation Services at IBM let us take a look at the microservice related problems enterprises often face in his highly recommended Dockercon interview with The New Stack. For a number of years - according to Jason - developer teams were struggling to deal with the increasing speed and delivery pressures they had to fulfill, but with the arrival of microservices, things have changed. In a microservices architecture, a complex problem can be broken up into units that are truly independent, so the parts can continue to work separately. The services are decoupled, so people can operate in small groups with less coordination and therefore they can respond more quickly and go faster. rdinate with the rest of the world. Right now, a lot of activity in the microservices space is about that what kind of tools and management systems teams have to put around their services to make microservices architectures a practical thing to do, said Jason. Teams with microservices have to understand how they want to factor their applications, what approaches they want to take for wiring everything together, and how can they reach the visibility of their services. The first fundamental problem developers have to solve is how the services are going to find each other. After that, they have to manage complexity by instituting some standardized approach for service discovery. The second biggest problem is about monitoring and bringing visibility to services. Developers have to understand what’s going on, by getting visibility into what is happening in their cloud-based network of services. Describing this in a simplified manner: an app can have hundreds of services behind the scene, and if it doesn’t work, someone has to figure out what’s going on. When developers just see miles of logs, they are going to have a hard time tracing back a problem to its cause. That’s why people working with microservices need excellent tools providing actionable outputs. At RisingStack, as an enterprise Node.js development and consulting company, we experienced the same problems with microservices since the moment of their conception. Our frustration of not having proper tools to solve these issues led us to develop our own solution called Trace, a microservice monitoring tool with distributed transaction tracking, error detection, and process monitoring for microservices. Our tool is currently in an open beta stage, therefore it can be used for free. If you’d like to give it a look, we’d appreciate your feedback on our Node.js monitoring platform. Sarah Wells, Principal Engineer of Financial Times told the story of what it’s like to move from monitoring a monolithic application to monitoring a microservice architecture in her Codemotion presentation named Alert overload: How to adopt a microservices architecture. About two years ago Financial Times started working on a new project where their goal was to build a new content platform (Fast FT) with a microservices architecture and APIs. The project team also started to do DevOps at the same time, because they were building a lot of new services, and they couldn’t take the time to hand them over to a different operations team. According to Sarah, supporting their own services meant that all of the pain the operations team used to have was suddenly transferred to them when they did shoddy monitoring and alerting. Let’s see what was the biggest challenge the DevOps team at Financial Times faced with a microservice architecture. According to Sarah, monitoring suddenly became much harder because they had a lot more systems than before. The app they built consisted of 45 microservices. They had 3 environments (integration, test, production) and 2 VM’s for each of those services. Since they ran 20 different checks per service (for things like CPU load, disk status, functional tests, etc.) and they ran them every 5 minutes at least. They ended up with 1,500,000 checks a day, which meant that they got alerts for unlikely and transient things all the time. One time a new developer joined Sarah’s team he couldn’t believe the number of emails they got from different monitoring services, so he started to count them. The result was over 19,000 system monitoring alerts in 50 days, 380 a day on average. Functional monitoring was also an issue since the team wanted to know when their response time was getting slow or when they logged or returned an error to anyone. Needless to say, they got swamped by the amount of alerts they got, namely 12,745 response time or error alerts in 50 days, 255 a day on average. Sarah and the team finally developed three core principles for making this almost unbearable situation better. 1.Think about monitoring from the start. The Financial Times team created far too many alerts without thinking about why they were doing it. As it turned out, it was the business functionality they really cared about, not the individual microservices - so that’s what their alerting should have focused on. At the end of the day, they only wanted an alert when they needed to take action. Otherwise, it was just noise. They made sure that the alerts are actually good because anyone reading them should be able to work out what they mean and what is needed to do. According to Sarah’s experiences, a good alert has clear language, is not fake, and contains a link to more explanatory information. They had also developed a smart solution: they tied all of their microservices together by passing around transaction ID’s as request headers, so the team instantly knew that if an error was caused thanks by an event in the system, and they could even search for it. The team also established health checks for every RESTful application, since they wanted to know early about problems that could affect their customers. 2.Use the right tools for the job. Since the platform Sarah’s team have been working on was an internal PaaS, they figured out that they needed some tooling to get the job done. They used different solutions for service monitoring, log aggregation, graphing, real-time error analysis, and also built some custom in-house tools for themselves. You can check out the individual tools in Sarah’s presentation from slide51. The main takeaway from their example was that they needed tools that could show if something happened 10 minutes ago but disappeared soon after - while everyone was in a meeting. They figured out the proper communication channel for alerting: it was not email, but Slack! The team had also established a clever reaction system to tag solved and work in progress issues in Slack. As soon as you stop paying attention to alerts, things will go wrong. When Sarah’s team gets an alert, they are reviewing it and acting on it immediately. If the alert isn’t good, they are either getting rid of it or making it better. If it isn’t helpful, they make sure that it won’t get sent again. It’s also important to make sure that alerts didn’t stop working. To check this, the team of FT often breaks things deliberately (they actually have a chaos monkey), just to make sure that alerts do fire. 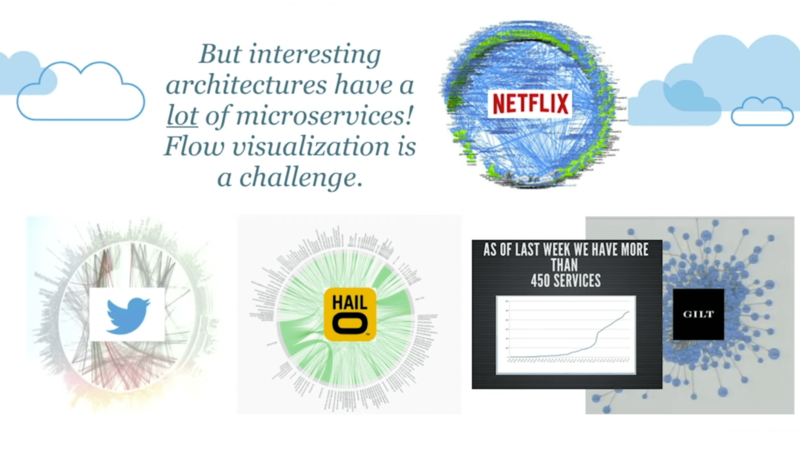 Adrian Cockroft had the privilege to gain a tremendous amount of microservices related experience by working as Chief Architect for 7 years at Netflix - a company heavily relying on a microservices architecture to provide excellent user experience. According to Adrian, teams working with microservices have to deal with three major problems right now. The second problem is that everything is ephemeral: Short lifetimes make it hard to aggregate historical views of services, and hand tweaked monitoring tools take too much work to keep running. 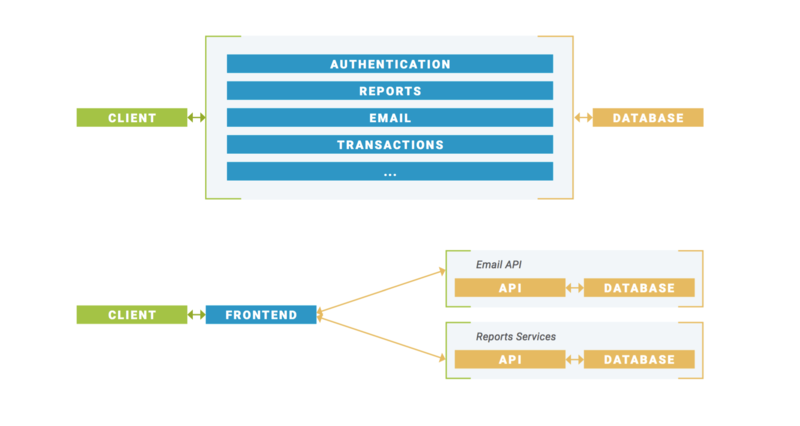 These microservice diagrams may look complicated, but looking inside a monolith would be even more confusing because it’s tangled together in ways you can’t even see. The system gets tangled together, like a big mass of spaghetti - said Adrian. Furthermore, managing scale is a grave challenge in the industry right now, because a single company can have tens of thousands of instances across five continents and that makes things complicated. Tooling is crucial in this area. Netflix built its own in-house monitoring tool. Twitter made its own tool too, which is called Zipkin (an open source Java monitoring tool based on Google’s Dapper technology). The problem with these tools is when teams look at the systems they have successfully mapped out, they often end up with the so-called Death Star diagrams. For Adrian, it was a great frustration at Netflix that every monitoring tool they tried exploded on impact. Another problem is that using, or even testing monitoring tools at scale gets expensive very quickly. Adrian illustrated his claim with a frightening example: The single biggest budget component for Amazon is the monitoring system: it takes up 20% of the costs. According to Adrian, there is still hope since the tools that are currently being built will get to the point where the large scale companies can use them as commercial products. If you have additional thoughts on the topic, feel free to share it in the comments section.